In the end I took bits and pieces from various sources and freestyled it to something I thought would work. Luckily it did. The key to a good result is most likely to let it take its time. Don't stress the onions, just let them cook together in their own time. It's a simple recipe, that gives a very rewarding result for fairly little work, so I'll stop jabbering now and let you have a look at how I made this. Heat a large (I used a stock pot) pot on a medium heat. Add enough olive oil to cover the bottom of the ppt. Once the olive oil is warm, chuck in the onions and season well. Let the onions slowly sweat whilst stirring fairly regularly. You want them to go all gooey and sticky without taking too much colour. Be prepared that they'll release more than a fair amount of liquid as you go ahead. Once they are getting to that nice and gooey stage you can pour in some Brandy if you feel like it. If not, don't. If you did feel like it, let the brandy cook off whilst you keep stirring the onions. At this stage, pour in the wine and raise the temperature under the pot. Let the wine boil away almost completely as you keep stirring the onions. Once the wine have more or less evaporated add in the stock and the thyme. Lower the heat and let this slowly simmer for 50 minutes or so. While it simmers, taste it and adjust the seasoning if needed. If you feel like it and you think the soup needs it, add a splash or two of Sherry Vinegar. Ladle the soup into bowls, top with a slice of bread and a good helping of grated gruyere. Pop the soup bowls under a pre-heated grill and let the cheese melt and turn a nice brown colour. 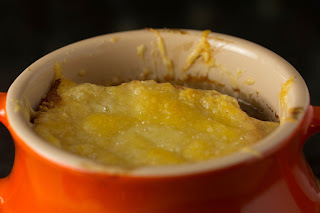 Looks really good, I've never put booze in my French Onion Soup, but I will definitely try this next time I make it. I'm not sure I can forgive you for even suggesting that one might put vinegar in though!! I find Emmental works on the top as well. Let me know how it works out with a bit of Brandy (or other booze you might try). I can see that working really well, adding a slightly nutty flavour to it all. Many thanks for taking the time to add a comment, it is really appreciated. Mike, sounds good! Of course, it all depends on the quality of the beef stock. I'm all for adding a splash of brandy--I splash a lot of brandy around my kitchen! Very versatile stuff, brandy. That photo makes me want to grab a spoon and dig in. Many thanks for taking the time to post a comment and for the kind words about the photo. I totally agree about the need for quality stock, you can't cook well without good quality ingredients. Thanks for taking the time to post a comment! Please let me know how it turns out. Perfect piece of work you’ve got done, this website is actually cool with superb details on delicious foods.